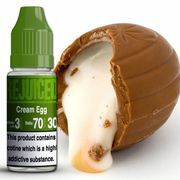 If you are looking for creme egg products, then you came to the right place. Whether you are looking for any kind of creme egg product, you are sure to find something right within your budget. Special offerings such as free deliveries and discounted rates are also up for grabs. Our supportive team of bargain hunters has listed the latest cheap creme egg deals and special offers available for you. 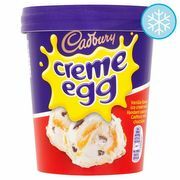 Save as much as 70% on selected creme egg products. You can get them from eBay, Sainsbury’s, Home Bargains, and other reputable UK sellers. Small, Cadbury's Creme Egg Mcflurry & Cadburys Caramel Mcflurry 99p!!! Cadbury Creme Eggs (Box of 48) - Only £15.80! Enjoy the sweetest creme egg savings online! A Cadbury Creme Egg is a chocolate bar that is made in the shape of an egg. The Cadbury Creme Egg consists of a thick chocolate shell that is housed in a yellow and white fondant filling. It mimics the yolk of a chicken egg. Cadbury Creme Eggs are one of the best selling products during special holidays including Easter and New Years Day. The annual sales of these gooey goodness are around £200 million. In 2016, the sales of their product plummeted after the decision of the management to change the recipe of the chocolate. Cadbury Creme Egg is produced in Cadbury UK in Scotland, Cadbury Adams in Canada, and The Hersheys Company in the United States. The Cadbury Creme Egg chocolate products are sold in various locations all over the world. They manufacture around 1.5 million Cadbury Creme Eggs per day at the Bournville factory in Birmingham. Filled eggs were initially manufactured by the Cadbury Brothers in 1923, the Cadbury Creme Egg, on the other hand, was introduced in 1963. They first sold the product as Fry’s Creme Eggs which incorporated the Fry’s brand. The product was renamed to Cadbury Creme Eggs in 1971. Eating chocolate definitely has many benefits for your health. It helps to improve blood circulation. Chocolate is also rich in antioxidants which helps remove toxins from the body just as long as you eat in moderation. Cadbury Chocolate Creme Eggs are also rich in various nutrients that are needed by the body to function properly. Studies also show that chocolates have certain properties that help soften the skin. It has anti aging properties that will make you look and feel a few years younger. Eating chocolate can also help reduce stress and improve your mood. It is highly advised that you eat chocolates moderately on a regular basis. Not only that it will improve your health but it will also help decrease your stress levels. Border Creme Eggs. This is wrapped in various colours of tartan foil and containing chocolate fondant. Mini Creme Eggs. These are bite-sized Creme Eggs that will surely satisfy your sweet tooth. Caramel Eggs. These are chocolate eggs that have a creamy caramel filling that was introduced in 1994. Caramilk Egg. This delicious variety of chocolate is only sold in the Canadian market only. Mini Caramel Eggs. These are bite size eggs that have a delicious caramel filling. Chocolate Orange Creme Eggs. These are Cadbury Chocolate Creme Eggs that have a hint of orange flavour. Berry Creme Eggs. This product is packaged in a magenta wrapper and pink fondant. Mint Creme Eggs. This has a green yolk which has a delicious minty flavour. Creme Egg Fondant in a Narrow Cardboard Tube. The company made this limited edition for people who have a passion for eating sweets. Creme Egg ice cream with a fondant sauce in milk chocolate. This has a creamy fondant sauce that has the right amount of sweetness. If you want to buy Cadbury Creme Eggs then you came to the right place. 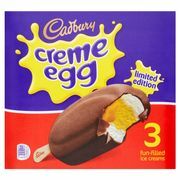 Here at Latest Deals, you will find the Cadbury Creme Egg 48 pack that you are looking for easily and at very reasonable rates. Good thing our team has listed the most affordable and latest deals from the most trusted and reliable brands and online retailers including Amazon, eBay, Sainsbury's and Home Bargains. Cadbury Creme Eggs for sale are available at your favourite UK sellers. Our team of community deal hunters has listed the latest cheap Creme Eggs deals and promotions you may want to check out. Our team of enthusiastic deal hunters has gathered and tested the latest deals so you can be assured that any voucher code is up-to-date. When purchasing food products online, make sure that you check the expiration date so that you will not encounter any problems once you receive the actual items. 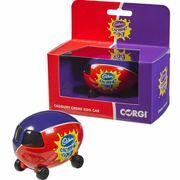 You might be interested in buying Cadburys Mini Creme Eggs. Make sure to use the latest Creme Egg bouquet voucher codes to save some money on the side. Our community of bargain hunters has gathered and tested the latest Cadbury Chocolate Creme Egg deals so you can be assured that any voucher code is up-to-date. Using the latest discount codes is an amazing way to get great value for your money. With our assistance, you can fulfill and purchase the Cadbury Chocolate Creme Eggs on your wishlist at very affordable prices. You get as much as 70% discount when you purchase Cadbury Chocolate Creme Egg bundles from your favourite UK sellers including ASDA, Morrisons, and Tesco. Save more money when you buy in bulk or in product bundles. You can get great value for your money when you purchase quality food items online.